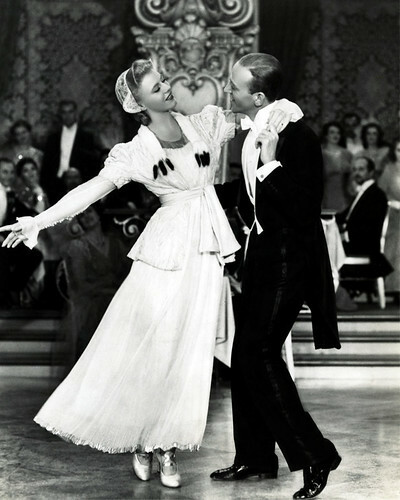 Ginger Rogers and Fred Astaire play a legendary dance team in The Story of Vernon and Irene Castle. The Stars: Fred Astaire, Ginger Rogers, Edna May Oliver, and Walter Brennan. Source Material: Irene Castle's memoirs, My Husband and Memories of Vernon Castle. A vintage poster for The Story of Vernon and Irene Castle. The Plot: Vaudeville second banana Vernon Castle (Astaire) meets stage-struck Irene Foote (Rogers). They fall in love and marry and soon they become world famous for their elegant ballroom dancing routines. Their perfect world is shattered when Vernon enlists in the Royal Air Force during World War I.
Irene Castle supervised all of Ginger Rogers elaborate costumes for The Story of Vernon and Irene Castle. Backstory: Vernon and Irene Castle are not well remembered today, but they were quite famous in the 1930s. The couple basically invented modern ballroom dancing in the 1910s, introducing steps like the foxtrot, Castle walk, and the tango. 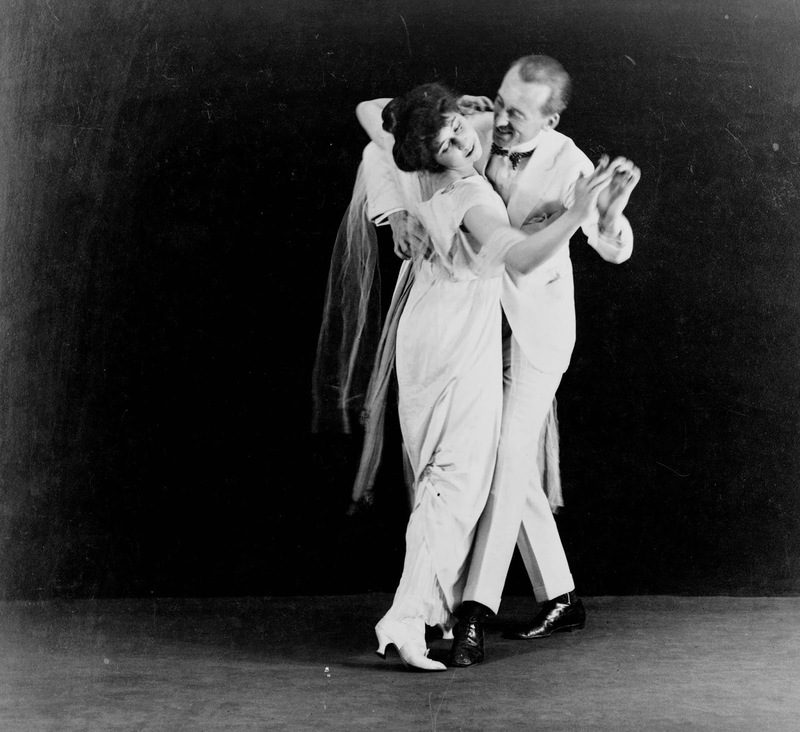 Astaire idolized Vernon Castle; in fact, the couple's silent films inspired Astaire to become a dancer. RKO bought the rights to Irene's memoirs as a vehicle for Astaire and Rogers, who were RKO's No. 1 box-office attraction. The real Vernon and Irene Castle. 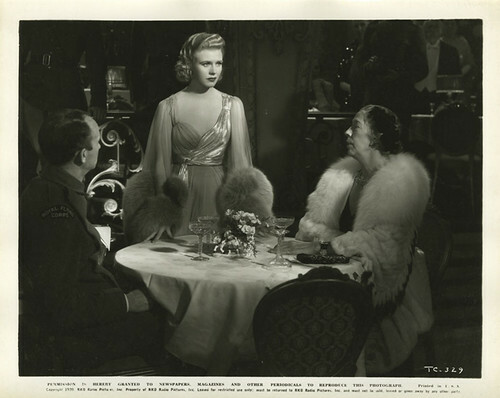 Best Performance: Ginger Rogers as Irene Castle. The Story of Vernon and Irene Castle isn't exactly an acting masterclass: As in most Astaire and Rogers features the real draw is the duo's dancing and the excellent supporting cast ( in this case, Edna May Oliver and Walter Brennan). However, Rogers gives a fine performance in the film, bringing to life Irene Foote's fierce love and devotion to her husband and her iron-willed determination to make them a successful dancing team. Best scene: Astaire performs a memorable tap dance while waiting for a train. Best Line: "What does ham mean?" Irene asking Vernon about his assessment of her performance style. Astaire and Rogers: The Story of Vernon and Irene Castle was Astaire and Rogers' last film together for RKO. The duo began their legendary partnership with supporting roles in Flying Down to Rio (1933) and they appeared in nine classic films throughout the 1930s, including The Gay Divorcee (1935), Roberta (1935), and Swing Time (1936). 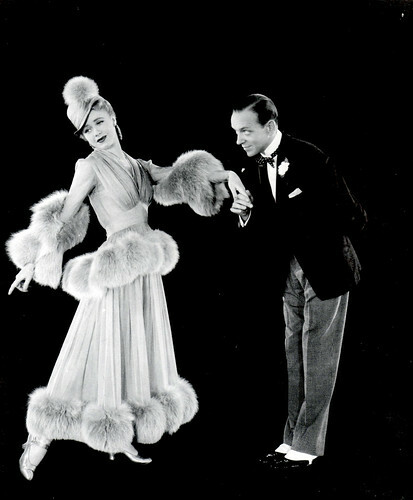 By 1939, both Astaire and Rogers were ready to go their separate ways: Astaire pursued a solo dancing career and Rogers focused on becoming a dramatic actress. Nevertheless, their final dance sequence in The Story of Vernon and Irene Castle was poignant, attracting a large crowd of RKO staff and executives. Astaire and Rogers reunited one more time for MGM's The Barkleys of Broadway (1949). The Castle's agent, Maggie Sutton (Edna May Oliver), with one of the couple's many beloved dogs. Irene Castle: RKO hired Irene Castle as a consultant for the film. She had a large amount of input on the script and she oversaw Rogers' costumes and styling. Rogers resented Castle's interference and she pushed back when Castle asked that she dye her famous blonde locks -- Castle was a brunette-- and cut her short to match Castle's own hairstyle (the Castle bob was quite popular in the 1930s and many fashionable woman had their hair styled like Irene). RKO finally paid Castle an extra $5,000 to go away and Castle happily returned to her favorite cause of campaigning for animal rights. Fun Fact: The Castles were huge celebrities in turn-of-the-century America, and, just like famous folks today, they endorsed a large line of products. The Story of Vernon and Irene Castle depicts some of these products including Castle candies, a line of hats, and Vernon Castle dancing shoes. Irene Castle (Ginger Rogers) waits for her husband, Vernon (Fred Astaire), to return from World War I in The Story of Vernon and Irene Castle. Walter Brennan and Edna May Oliver are seated with Rogers. Why it's essential: The Story of Vernon and Irene Castle is not a typical Astaire and Rogers film. It's probably the weakest of the nine films they made with RKO. The pair's best films were screwball comedies that highlight their glorious dancing, and neither Astaire or Rogers seem entirely comfortable playing heavy dramatic scenes in period costumes. However, the film is still interesting to watch because of the Astaire and Roger's flawless interpretations of the Castles' intricate dances. Availability: The Story of Vernon and Irene Castle is available on DVD and video on demand. Go here, for more in our essentials series. Next week, Laurence Olivier and Merle Oberon wander the Yorkshire moors in Wuthering Heights.